Keeping your Wichita home's indoor air quality safe and clean is a major priority. The average person spends around 90% of their lives indoors, so if you're breathing in contaminants and pollutants during that time, it can take a detrimental toll on your health. At Ball Heating & Air Conditioning, our professional heating and air conditioning contractors can offer services that help keep your home's indoor air as clean as possible. Your ductwork is what carries heated or cool air to the different parts of your Wichita home. When your ducts are in a poor state of repair, you could see your home's energy efficiency decline sharply, and your heating and air conditioning make up a huge portion of your overall energy costs. Keeping your ducts properly repaired, sealed, and fitted to your system is the best way to reduce your energy waste and keep your home's indoor air as clean and healthy as possible. Because your ducts distribute air throughout your Wichita home almost constantly, any contaminants or pollutants that get into the ductwork can pollute your entire home's air. Fumes from household and garden chemicals, insulation particles, dust mites, and more can enter your duct system and cause a number of health problems, from aggravating allergies to triggering asthmatic symptoms. 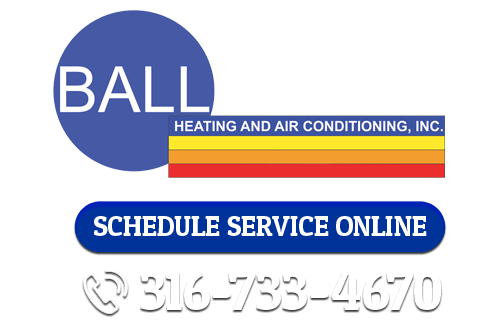 If you're looking for indoor air quality services in Wichita, call Ball Heating & Air Conditioning at 316-733-4670, or fill out our online request form.